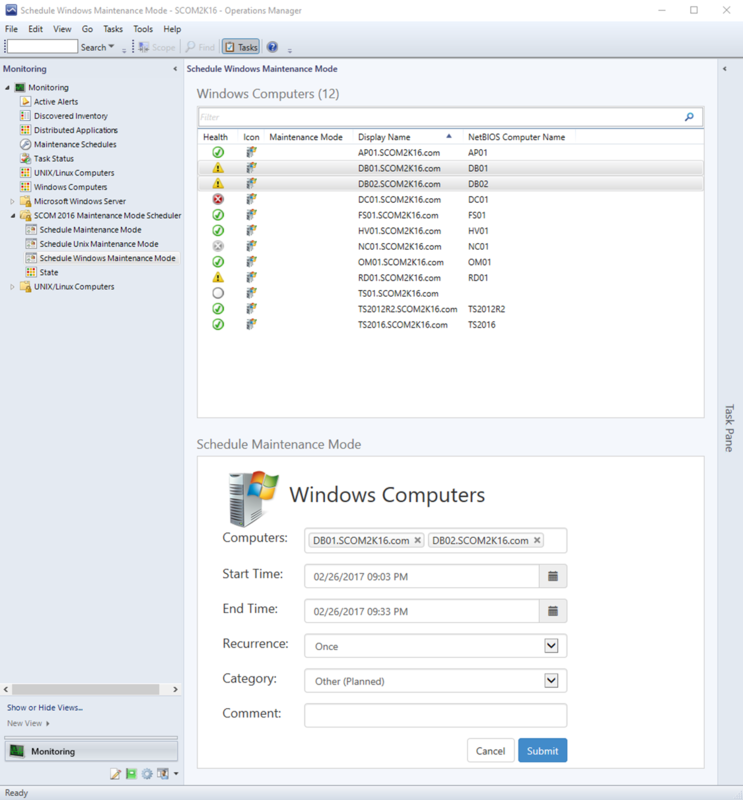 The SCOM 2016 Maintenance Mode Scheduler application makes enabling and scheduling maintenance mode simple for all users. Your IT staff will no longer have a reason why a server wasn’t put into maintenance mode. The application is an intuitive HTML5 interface written specifically for SCOM 2016 and SCOM 1801 from the ground up. It deeply integrates into SCOM 2016 using all the new native maintenance mode scheduling capabilities. All your IT staff can quickly schedule maintenance mode without having to install and use the slow console. Schedule Windows/Unix Computers, Groups, and Objects like SQL Databases for maintenance in a few seconds. Import a CSV containing a list of computers or groups for scheduled maintenance. Instant MM: Server and application admins can instantly place servers into maintenance during reboots and maintenance windows directly from the server without requiring admin privileges to the server. Instant MM can be called by a VB, PowerShell, or code from anywhere. This can be used to start and stop maintenance on any server for a specified amount of time. This makes it easy to integrate into your current change or software management process. Integrated Dashboard works in the SCOM Console. Instant Maintenance Mode with URL Parameters. Specify URL parameters ComputerName, ID, Min, Action to control maintenance mode. Uses the same role based permissions that SCOM 2016 uses. Users will only be able to schedule maintenance mode for servers, groups, or objects they already have access to in SCOM. 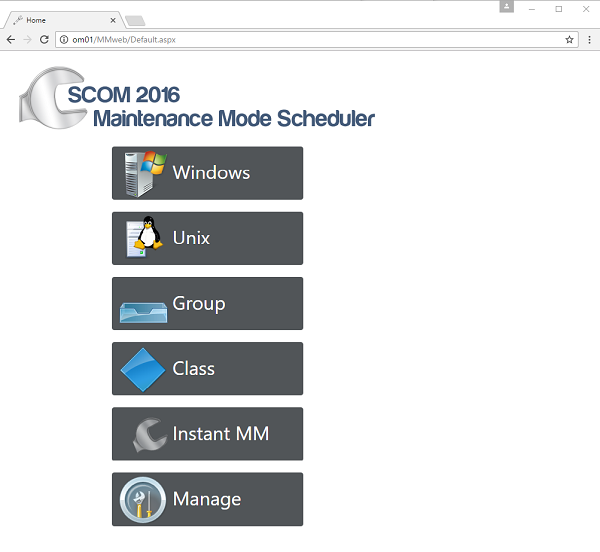 New in SCOM Maintenance Mode Scheduler 2016 is the ability to add parameters to the URL. Instant Maintenance Mode using PowerShell, VBScript or Code. Using the new URL Parameters, you can now put servers into Maintenance Mode from any computer using a script or code. Typical use case would be using SCCM when updates or software is installed. SCCM would execute the VB or PowerShell script before the install process to start maintenance mode. After the updates or software is installed SCCM would call the script to stop maintenance mode. Nice! This is very interesting and will make or worklifes easier! can it be installed on a SCOM 2012 R2 server? or is it just for SCOM 2016? Would this work on SCOM 1801 also?